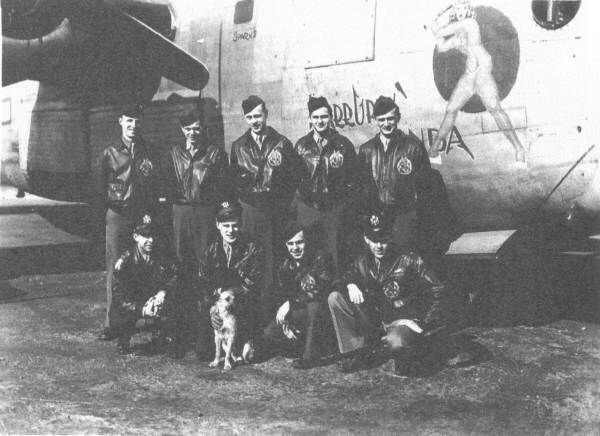 Lt Robert B. Lehr and crew joined the 458th on July 20, 1944 and were assigned to the 752nd Squadron. Their first mission was 11 days later, but on this first occasion they were forced to abort due to an oil leak in the #1 engine. They had better luck the next day when they were able to complete their first mission, which was directed at three Noball (rocket emplacement) targets in France. This was the 458th’s 100th mission. Their second mission on August 2nd was to another three Noball installations. 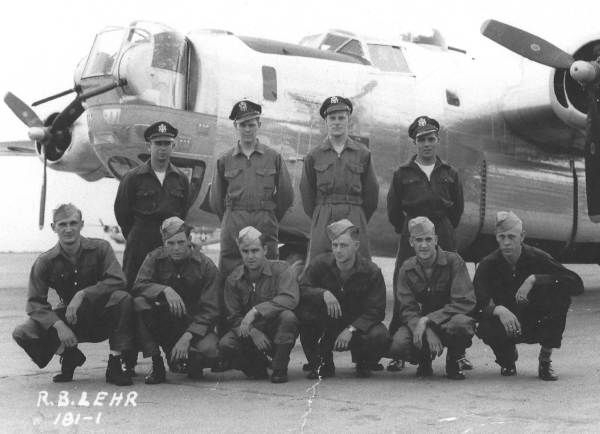 The month of September began with combat missions of which the Lehr crew flew four. One of these was abandoned by the group due to weather and another on September 8th saw the crew abort once again, this time they could not keep up with the formation and had to turn back after falling more than a mile behind. The last combat mission for the group was flown on September 11th, a mission in which Lehr’s crew did not participate. The remainder of the month was devoted to transporting gasoline to General Patton’s Third Army. Patton’s advance through France had been so swift that the regular land supply lines were having difficulty in keeping his tanks equipped with fuel. The 458th, along with several other 2nd Bomb Division groups were utilized to fly gasoline to recently overrun Luftwaffe airfields in France, unload and return. While there is no record of these “Truckin’ Missions” as they were called, the son of co-pilot Herb “Woody” Woodward said that the Lehr crew participated in several of these runs. The crews felt that these “missions” were more dangerous than combat. Fill a machine like the Liberator, which already had a reputation for a leaky fuel system with several thousand additional gallons of gasoline, take a skeleton crew and fly at no more than a couple of thousand feet to France, landing on airfields that had been, up until a few days or weeks before in German hands, and receive no mission credit! The group lost two crews during these runs: Lt Herbert H. Humke on takeoff at Horsham and Lt George J. Koehn, shot down after taking off from France when they strayed too close to the German lines and were downed by flak. 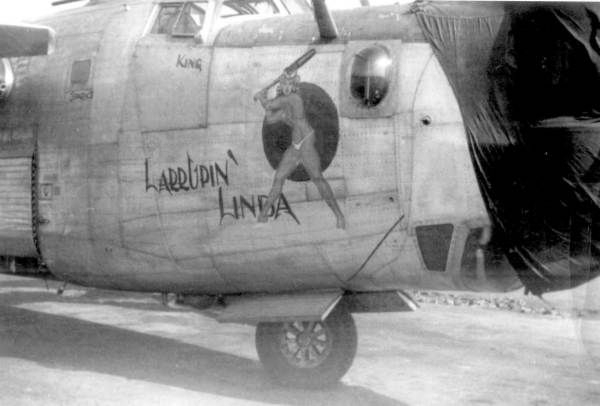 The 458th lists four additional B-24’s being written off due to accidents on either takeoff or landing, one of which involved a 44th BG Liberator flown by Lt Kermit A. Wagner. No fatalities were listed on these additional four, but all aircraft were salvaged and some crew members sustained minor injuries. Lehr flew five missions in October including two aborted attempts early in the month. On October 11th the officers are shown going on Air Crew Leave. It is assumed that the enlisted men were afforded a leave as well, but the records do not state this. There is a large gap in missions between November 6th and the 21st, the reason for this is unknown. The crew finished 1944 with 22 completed combat missions leaving 13 still to fly. On January 8th Lehr drew assembly ship duty, flying the group’s formator Spotted Ape in order to get the group assembled over the field. Three additional missions were flown in January. February saw the crew fly four consecutive missions to Magdeburg, Germany in the early half of the month and five missions in the latter half of the month including two aborts. On the February 25th abort, the crew had to feather #4 engine just after takeoff when the oil pressure dropped to 35psi. They landed safely and upon inspection the engine was found to be seized, drained of all oil. Three final missions in March 1945 rounded out the crew’s tour. S/Sgt Robert F. Brittain, assigned with the crew in July, went to Radar Counter Measures (RCM) School in September 1944 and graduated in November. It is assumed he flew with several crews as the RCM Operator. (It is possible that Sgt Robert Shea filled his place on the crew. Shea had been assigned with Lt George Koehn’s crew on July 31, 1944. He was not on the Truckin’ Mission on which Koehn and most of his crew were shot down.) 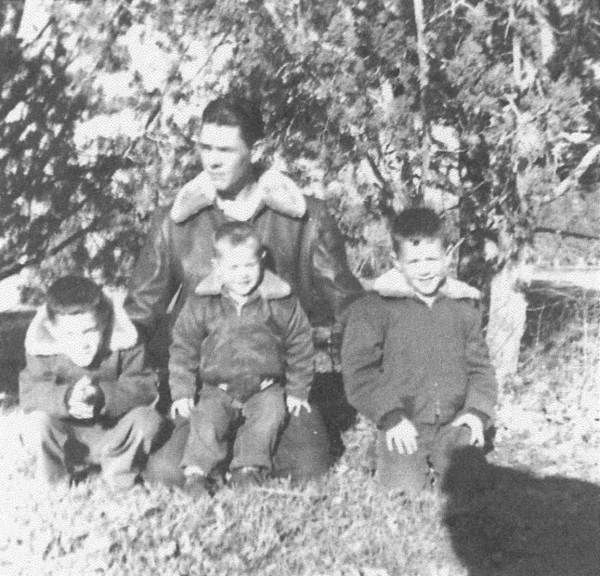 On January 17, 1945 Brittain was flying with Lt Roger F. Hicks’ crew when they were forced to bail out over Sweden, spending the rest of the war as internees. Sgt Carl R. Hein also flew with Lehr on numerous occasions. He had been assigned with Lt Frank A. Josephson and crew in August 1944. Group and squadron records do not mention much about Sgt Wallace S. Young, a gunner assigned with Lehr. It is assumed that he flew most of his missions with the crew. In March 1945 he evidently got into a little trouble and was reduced in grade to Private. Robert Lehr was 23 years old. AIRLINER CRASHES IN FLAMES IN NFLD. RESCUE CREWS REPORT 39 PERSONS ARE KILLED. Giant Four-Engined Skymaster Crashes Into Newfoundland Hill After Take-Off From Stephenville -- Worst Commercial Airline Accident In History. New York, Oct. 3 -- (A.P.) -- An American Overseas Airlines plane plunged in flames in the wilds of Newfoundland today, and hours later the coast guard said rescue parties reported the 39 persons aboard were dead. The coast guard said the brief message telling of the worst commercial airline accident in history was received at 12:50 p.m. C.S.T. It said helicopters were en route to Stephenville, 10 miles from the crash, to take airline, coast guard and army officials to the scene. Six of the passengers -- none of whom was Canadian -- on the ill-fated plane were children, accompanying their mothers who were en route to Europe to join their husbands. There were 12 women aboard. The four-engine DC-4, en route from New York to Berlin, crashed ten minutes after it left Stephenville, Nfld., at 2:24 a.m. C.S.T. The coast guard in a radio message said three persons, believed to be Newfoundland civilians, were at the scene and an army searching party was at the foot of the hill into which the plane crashed. The message said the searching party had one-half mile to go. The plane crashed 100 feet from the top of the hill, which is covered with rocks and scrub trees. The message, sent from a coast guard plane at the scene, said the airliner appeared to have exploded after the crash and that only a tiny fragment of the ship was visible. There was a heavy rain at the time. It was the second plane tragedy in the Newfoundland wilds in two weeks. On Sept. 18 a Belgian Sabena airliner crashed near Gander, killing 27 of the 44 aboard. Stephenville is on the west coast of Newfoundland, approximately 225 miles west of Gander airport. First reports from relatives of the passengers, indicated some of the women and children were en route to Germany to join their husbands. At Gander, officials of the airline said rescue planes which flew over the area reported the wreckage still was burning four hours after the crash and that it was unlikely anyone aboard was alive. The big plane, a Skymaster, smashed into a hillside 20 miles from Harmon Field at Stephenville, where it had refuelled because the Gander airport was closed in with rain and fog. The ceiling at Harmon Field was 5,000 feet and visibility 10 miles. The coast guard dispatched a B-17 and a helicopter from Argentia, Nfld., the helicopter was expected to reach the scene at 1:30 p.m. C.S.T. today. There have been three 27-victim plane crashes in American commercial aviation. 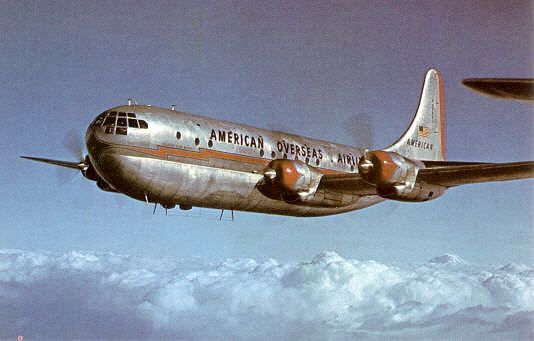 In addition to the Sabena crash, other such crashes involved an American Airlines plane at San Diego, Calif., March 3, 1946, and a non-scheduled Viking Airline plunge near Richmond, Va., last May 16. An Army official reported at Fort Totten, N.Y., that paratroopers from Presque Isle, Me., and Goose Bay, Labrador, were speeding to Harmon Field, Stephenville, to take part in the search and necessary rescue work. Low ceillings and rain are prevailing near the scene of the wreck, the coast guard said. Persons aboard the plane were eight crew members, including a stewardess, and 31 passengers. In a message to the coast guard, the North Atlantic ocean patrol commander said: "Army air searchers report that the possibility of survivors are doubtful. Rescue parties on foot may reach the scene in four to eight hours." Among the passengers were HELEN KENT DOWNING, 26, of Thomson, Ga., and her two children, LAURIE ELIZABETH, four, and BARBARA, 20 months. St. John's, Nfld., Oct. 3. -- (C.P. Cable) -- Rescue planes which flew over the rugged western Newfoundland territory where an American Overseas Airways plane crashed reported today it was "impossible to feel whether there is any sign of life." The plane, which reports reaching here said had 31 passengers and eight crew members aboard, crashed early this morning in a take-off from Harmon Field, the United States base near Stephenville. Col. HOWARD MAXWELL, commanding officer at Harmon Field, said in a report to nearby Fort Pepperell that he had just returned from a flight over the scene of the wreck. He said it had occurred in rough country and it would take considerable time for a rescue party to reach the spot. Col. MAXWELL said he could see no sign of life around the wreckage. RESCUE PARTIES FAIL TO IDENTIFY ANY OCCUPANTS AIRLINER CRASH. GOVT. AND AIRLINE OFFICIALS BEGIN PROBE OF TRAGEDY. Stephenville, Nfld., Oct. 4. -- (C.P. Cable) -- Government and airline officials were expected today to begin an investigation into Newfoundland's second air tragedy within a month as the cause of the worst disaster in the history of American commercial aviation remained unexplained. 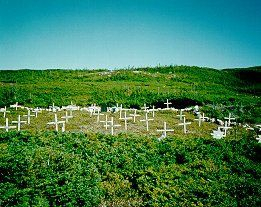 None of the 39 occupants of the American Overseas Airlines Skymaster could be identified when rescue parties reached the charred wreckage yesterday at the summit of a hill 10 miles from this western Newfoundland village. The plane, bound for Shannon, Eire, from New York, landed at nearby Harmon field early Thursday to refuel because the huge Gander airport 225 miles east of here was closed in by weather. Ten minutes after the take-off in the pre-dawn darkness, the plane smashed into the hillside. It was considered that matters pertaining to the crash would be under jurisdiction of United States authorities who operate Harmon field, which was involved in the 1940 British-American destroyers for bases deal. Newfoundland government officials left Gander after the disaster to begin an investigation. Shannon Airport, Eire, Oct. 4. -- (Reuters) -- The American Airlines Skymaster which crashed in Newfoundland early Thursday with the lost of 39 lives burst into flames which rose to 2,000 feet an eyewitness said upon his arrival from Harmon Field, Nfld. The eyewitness was captain of another American Airlines plane which left Harmon Field shortly after the one which crashed. "We were still on the ground and about eight minutes after the Berlin plane had taken off I saw a great fire rise up to a height of 2,000 feet," the captain said. "Later the fire came down to 500 feet and finally to 100 feet. The take-off looked normal to me so I could not understand why the plane should strike the mountain." "A little later we flew over the site but only a slight glow could be seen as there were low-flying clouds at the time." Another person who saw the fire from Harmon Field was ALEC WINE, returning to Ireland with his family after a visit to the United States. "We rushed out to see a great ball of fire on the mountain which reminded me of a volcano," he said. STEPHEN KINGSTON, a native of New York here to visit his parents in County Cork, said. "As we came out of the restaurant we watched the Berlin plane take off. About five minutes later we saw a great ball of fire and later a glow rose on the mountain." "Twenty-five minutes later as we flew over the scene there was still an enormous blaze burning." The pilot of the ill-fated plane, Capt. WILLIAM A. WESTFIELD, had been based at Shannon for three years and had been granted six weeks leave to make arrangements for the transportation of his wife and baby to Eire as he had rented a house at Limerick. Capt. WILLIAM A. WESTERFIELD, pilot, 31, Patchogue, N.Y.
ROBERT BECKMAN LEHR, co-pilot, 23, Middle Village, N.Y.
JOHN B. TIERNEY, JR., second navigator, 28, Jamaica, N.Y.
JAMES M. BARRY, radio officer, 25, Kingston, N.Y.
MARK SPELAR, flight engineer, 30, Jackson Heights, N.Y.
HERBERT B. EWING, purser, 35, Jackson Heights, N.Y.
JEROME LEWIS, navigator, 29, Long Beach, Long Island, N.Y.
MARGARET ANN BURLEIGH, stewardess, 22, Jackson Heights, N.Y.
JOHN SNELL, San Gabriel, Calif.
J. OTTO STERN, New York City. ALBERT B. RITTS, New Rochelle, N.Y.
ETHEL AGNES MEISSLER, Wichita, Kan.
HARRIET VAN HOUTEN, Yonkers, N.Y.
JANET VAN HOUTEN, same address (infant). JOSEPH H. PERCY, Woodmere, N.Y.
JOHN THOMAS SIMMONS, Richmond, Va.
CLAIRE EVANS ZANE, South Seattle, Wash.
WILLIAM FREDERICK LOTZE, Burbank, Calif.
BENJAMIN R. ALPERT, New York City. HELEN KENT DOWNING, Thompson, Ga.
LAURIE ELIZABETH DOWNING, same address. BARBARA KENT DOWNING, same address (infant). ALVA J. MARLEY, Long Beach, Calif.
DOROTHY NELSON McCORMICK, Lebanon, Mo. C. FRANK SCHMIDT, Kenosha, Wis.
RUTH L. SCHMIDT, same address. DR. RUDOLPH MAX GOEPP, JR., New Castle, Del. ALDA BOYD STABLER, Belwood, Pa.
VIRGINIA EDWARDS BELANGER, Kingston, N.J.
CAROLINE SMITH CRAWFORD, APO 755, N.Y.
MARGOT CAROLINE CRAWFORD, same address, 3 months old child. VERA C. HIMES, North Arlington, Va.
LUCY JEAN HAWKINS, Marion, Mass. ELIZABETH EASTMAN HAWKINS, same address. MARY JANE MERRILL, Farmington, Md. HORACE EASTBURN THOMPSON, JR., Philadelphia, Pa.